Islamic Conference Youth Forum for Dialogue and Cooperation (ICYF), an international institution affiliated to the Organization of Islamic Cooperation (OIC), announces the below call for application issued by the Higher Council of Youth and Sports of the State of Palestine on “Human Faces of Al-Quds” International Youth Photography Competition to be held within the framework of the “Al-Quds Ash-Sharif – OIC Youth Capital 2018”International Programme. Focusing on Islamic and inter-cultural heritage of Al-Quds, the “Human Faces of Al-Quds” envisages to describe the daily life of Palestinian residents of Al-Quds as well as troubles and injustices they face. The photographers are invited to demonstrate their vision of Al-Quds Ash-Sharif, and its importance in terms of Islamic heritage, inter-cultural and inter-civilizational dialogue, and the challenges to its sanctity under Israeli occupation. It will create solidarity with the residents of the holy city, casting light on their daily lives, as well as the struggles and injustices they contend with on a daily basis. Photographs of the difficulties and challenges of life; specifically in visiting Al-Quds sanctuaries under Israeli occupation; that capture and document challenges to the sanctity, soul and religious character of Al-Quds Ash-Sharif. Photographs of the daily life of residents of Al-Quds Ash-Sharif under Israeli occupation; that capture their spirit of resilience, challenges, perseverance, griefs and hopes. This competition is open to youth of all faiths and nationalities between the ages of 18 and 35. Non-professional photographers are particularly encouraged to participate. Participation in the competition is open to all and free of charge. Under all competition themes, monochrome (or black and white) and colour photos must be uploaded as a file with DPI up to 72 pixels in JPG format and RGB colour model. The longest side should be 1500 pixels with a ratio of 2*3 or 1*1. The Photoshop output level of the photos should not be less than 10. Panorama photos are not accepted. The selected photos are subject to further demonstration in the exhibitions to be held by the Organizers of the competition. The photographers whose photos are selected and printed in the competition visuals are conferred award recognition (the selected finalist photos will be property of the organizers). By submission of the image, the applicant accepts the terms of the competition. The entrant is accountable for any legal or penal consequences arising from copyright infringement on the part of them. 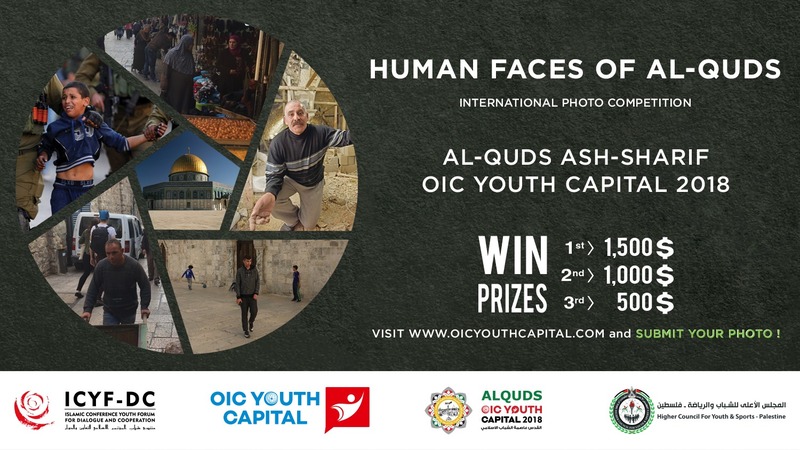 The applicants are invited to share the uploaded photos in different social media channels (in particular, Twitter, Instagram, Tumblr and Facebook) with the following Hashtags: #AlQudsOICYouthCapital2018 and #HumanFacesOfAlQuds . The ICYF and Higher Council of Youth and Sports of the State of Palestine assume no responsibility for any error, omission, interruption, deletion, defect, or delay in operation or transmission; communications line failure; theft or destruction of or unauthorized access to the competition entries or entry forms; or alteration of entries or entry forms.